Offense has been hard to come by of late for the Rockies, so it only seems fitting that a pitcher’s base hit and some good luck played a role in Colorado’s 4-3 Labor Day win over the San Francisco Giants at Coors Field. Starting pitcher Chad Bettis was solid on the mound and clutch at the plate. The right-hander sent a two-out single to right field in the fourth inning, scoring Carlos Gonzalez and tying the ballgame at three. It was his first hit and first RBI of the season. 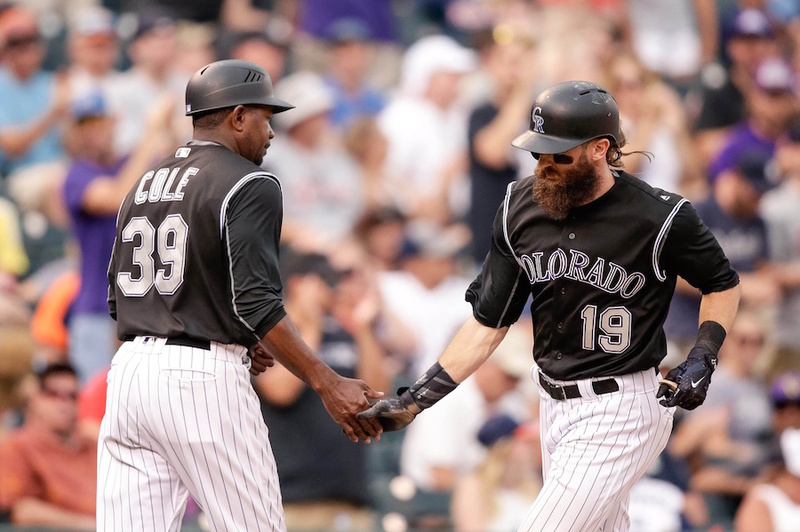 Charlie Blackmon, the top hitter in the National League, got an assist from the strong winds blowing at Coors Field to lead off the bottom of the ninth. The play was recorded as a double in the scorebook, but Giants left fielder Mac Williamson put leather on a ball that originally appeared headed to Denard Span in center. After DJ LeMahieu grounded out, an intentional walk to Nolan Arenado and a four-pitch walk to Gerardo Parra moved Blackmon to third. Pat Valaika struck out on three straight pitches from Cory Gearrin to set up a showdown with Carlos Gonzalez. Four pitches later, Gonzalez was walking to first and Blackmon was walking home for a walk-off win. It was a three-hit, two run night for the Rockies centerfielder. Blackmon homered in the third inning, then added a base hit to follow Bettis in the fourth to keep the inning alive. LeMahieu followed Blackmon with a base hit to score Bettis and give the Rockies their first lead in 39 innings. Bettis allowed a pair of home runs for the third consecutive game, but didn’t allow them to sink his day. San Francisco jumped out to a 2-0 lead on solo home runs by Joe Panik in the first and Span in the third. Bettis allowed one more run on the day, courtesy of those same two. Span led off the fifth with a double and Panik drove him in with a single. Bettis retired Buster Posey before giving way to Chris Rusin who would end the threat. But it wasn’t the last time Span and Panik would trouble the Rockies. Tied at three in the eighth inning, Span and Panik notched back-to-back, one-out base hits off Jake McGee. The lefty buckled down, though, and got Posey to ground into an inning-ending double play. Giants closer Mark Melancon walked Jonathan Lucroy with two out in the eighth, and Mike Tauchman (running for Lucroy) moved into scoring position on a wild pitch, but Trevor Story struck out looking to end the inning. Bud Black called on his own closer, Greg Holland, to keep things locked up in the ninth. After an uneventful, albeit meaningless, ninth inning pitched in a loss on Sunday, Holland had to make a miraculous play in this one. With one out, Pablo Sandoval sent a 1-0 slider screaming back up the middle, which Holland fielded on one hop while falling flat on his back. He rebounded to throw out Sandoval, then got Hunter Pence to ground out to short to end the inning and earn the win. The Rockies and Giants continue their three-game series at Coors Field on Tuesday at 6:40 p.m. MDT.